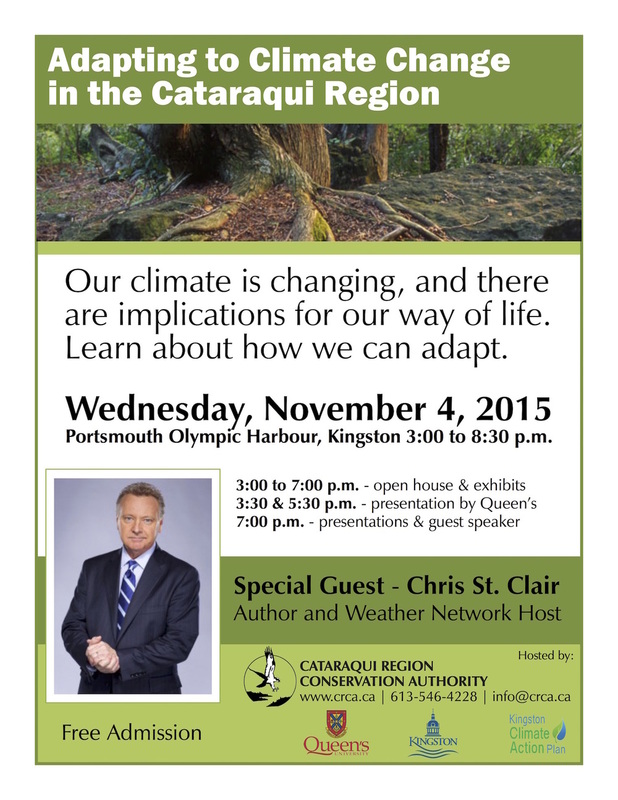 Adapting to Climate Change in the Cataraqui Region on Wednesday, November 4 from 3 p.m.to 8:30 p.m. in the Press Lounge at Portsmouth Olympic Harbour, 53 Yonge St., Kingston. The Conservation Authority marked its 50th anniversary this year, and is hosting this event as it looks to the future. The CRCA is partnering with the City of Kingston and the Queen’s University School of Urban and Regional Planning to put on the event which will feature an open-house format from 3 p.m. to 7 p.m. with exhibits where visitors can learn how various groups and organizations in the community are actively engaged in climate change research, education and planning. At 3:30 and 5:30 p.m. Queen’s students will take the stage to present early findings from their climate change research and engage visitors in a special activity. A series of formal talks will take place starting at 7 p.m., including a welcome speech from the CRCA, as well as a brief presentation by the City of Kingston discussing the Kingston Climate Action Plan. Students from Queen’s University’s School of Urban and Regional Planning will talk about their climate change work, before introducing the event’s guest speaker Chris St. Clair. All interested members of the community are welcome to attend. Admission is free.